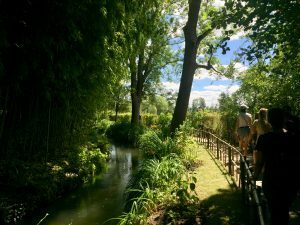 When we first got the itinerary for this trip and I saw that we were going to go to Giverny I was very excited! 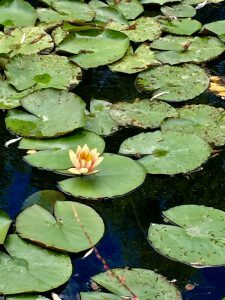 Being such a huge fan of Monet’s works, it was a goal of mine to see his garden and the lily pond that inspired his famous series “Les Nymphéas” that we were able to see at the musee de l’orangerie a week ago. 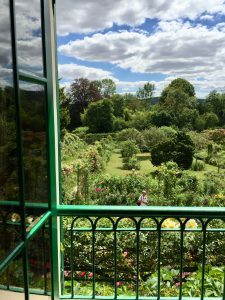 It was quite a trip to get to Normandy, first we had to take the metro from our homestay, then we all met up and took a train to Vernon, and then we took a shuttle to Giverny. For me though, the traveling was worth it! We had a tour guide who led us through the gardens first. 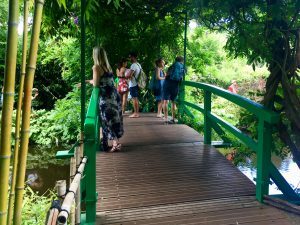 There are two gardens, the water garden and the flower garden, and we started by walking through the water garden first. It definitely lived up to my expectations! We walked along a river that was next to a forest of bamboo. Then we crossed over to get to the main area of this garden where the infamous water lily pond and Japanese bridge is. The pictures really don’t do it justice it was beautiful. We learned also that Monet didn’t create this garden at first with the intention of painting it. 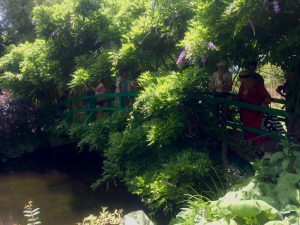 The flower garden was more designed for painting, however as we know, Monet does eventually start painting the water garden, specifically the water lilies and the Japanese bridge. 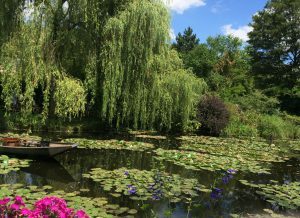 We also learned that Monet moved to Giverny because he was attracted to the constantly changing light, which we saw first hand. It was a beautiful day and it’s true that one second it was almost blindingly bright, and the next the light dimmed when the clouds moved. Monet was very interested in capturing this change in light in his paintings which is why he would create many series that focused on one place or thing during different weather, time of day, and season. Our tour guide also talked to us more about Monet’s life at Giverny. When he first arrived he did not have a lot of money, as his paintings where not popular with the french people at all. So, at first he worked in the gardens himself. 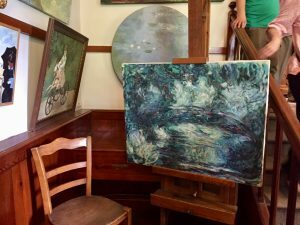 Eventually, with the help of art dealer Paul Durand-Ruel and Mary Cassatt, an American Impressionist artist, Monet’s works were sold to Americans who, unlike the french, were huge fans of impressionist works. He quickly garnered a lot of success and became quite rich. So, he was able to hire workers to help with his garden. He had around seven other people helping him at one point. Today, there are ten full time gardeners, as well as volunteers who maintain the two gardens. 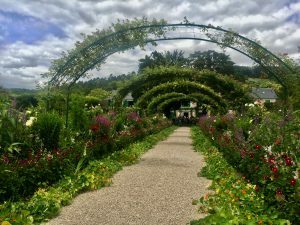 We made our way to the second garden which was filled with various different kinds of flowers, with butterflies and honey bees flying all around, and the house at the far edge of the garden. The main path through the garden to the house has beautiful green arches that frame the house and pull the garden together. Inside the house we saw replicas of Monet’s vast collection of Japanese wood block prints. These prints were very popular among impressionists and their compositions, including a lot of interesting diagonals and odd croppings, influences a lot of impressionist works. 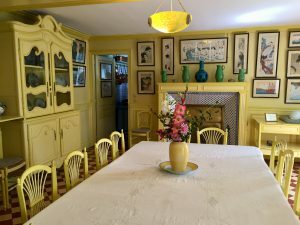 We also saw Monet’s bright yellow dining room. We were told that the room was painted so bright in order to better show off his Japanese wood block prints. 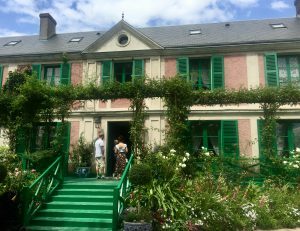 It was amazing that I was able to see the place that inspired so many of Monet’s most famous works. 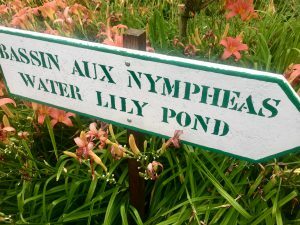 And I can definitely say our trip to Giverny was a very memorable one! !